It all starts with a nice manufactured plank for the neck-thru middle section made of Bamboo interspersed with multiple layers of Carbon fiber laminated with high-grade epoxy. Distribution: Tropical and subtropical Asia. Native to Malaysia and Indonesia, but was introduced all over South-East Asia. Manufactured bamboo planks for flooring (alternative to hard wood), typically made in China, are readily available. The bamboo used for these planks is called Moso (Phyllostachys pubescens). This is another giant species which reaches a maximum height of 20 meters and 18 cm. maximum diameter. This particular species is native to China and Japan. I find these ready-made planks to be easily machinable. In terms of rigidity, however, these planks pale in comparison to the other species listed above, especially Thorny Giant (Bambusa blumeana Schultes F). That’s the prime reason why I will not be using off the shelf manufactured bamboo planks. Also, I will be using only high grade epoxy for lamination. Off the shelf bamboo planks use water soluble PVA, which is a nice glue, but in my opinion, is not good enough. Finally, I also have to consider the need to intersperse Carbon fiber with bamboo. Obviously, with all these in mind, I have to manufacture the planks myself using only the most suitable material. 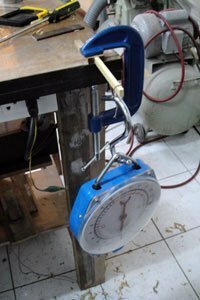 What we are particularly interested in is the material’s flexural strength —maximum stress on the tensile side of a loaded beam just prior to failure. The strings want to bend the neck. Guitar strings (light to heavy gauge) pull the nut towards the bridge with around 40 kg (88 lbs) to 50 kg (110 lbs) of force. The material (together with the truss rod) must be able to withstand this bending force. The table below compares various bamboo species along with hard maple and ebony. To test the material’s flexural strength, small strips (10mm x 5mm x 100mm) are subjected to incremental perpendicular force at its end (picture at right) until the material fractures. The force required to bend the material until the point of fracture is then tabulated for each material. It is surprising to see that the flexural strength of Thorny Giant surpasses that of Ebony. This finding is probably due to flexible nature of bamboo. 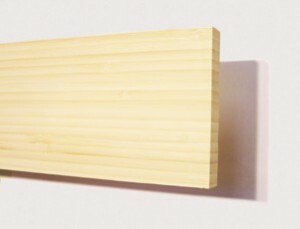 In the small experiment, bamboo flexes as much as 20 to 30 degress before fracturing. However, while Thorny Giant has superior strength, early experiments with it reveal a crucial problem: it is very difficult to machine using standard wood working tools. Even the best carbide router bits and planer blades easily get dull. Sweet Giant places third in the chart ahead of hard maple. Compared to Thorny Giant, Sweet Giant is easier to machine. Its nodes are spaced farther apart and the culms are tall and relatively straight with no bulge at the nodes —properties that make it generally more suitable for our purpose. Given all these data points, here’s the final verdict: We will be using Thorny Giant as a suitable replacement for Ebony to be used as fretboard material. We will also be using Sweet Giant as a suitable replacement for Maple to be used as the Thru-Neck material. As mentioned, bamboo will be interspersed with multiple layers of Carbon fiber and laminated with high-grade epoxy.